The Pfluger pedestrian bridge over Lady Bird lake is always a great place for sidewalk astronomy. Hundreds of people flow by every hour. They are already outside enjoying nature and usually in no hurry. 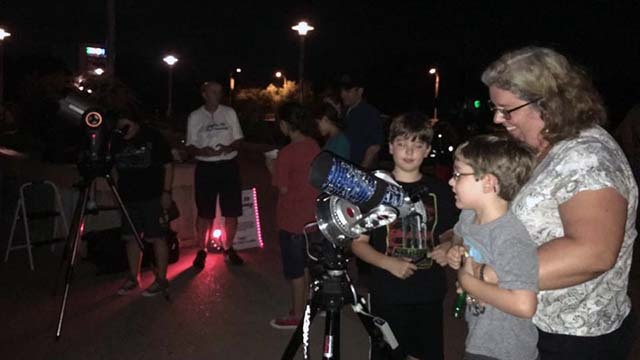 It is even more fun when I meet up with other amateur astronomers like Ed LaBelle and we have more telescopes there. I was worried Friday night as a thunderstorm just brushed downtown to the east, but the skies cleared by sunset. We had some good views of Jupiter, Saturn, and the Moon in spite of dodgy transparency and thin clouds. Friday nights there is often a drum circle nearby which gives us a great sound track. This time there was what I'd describe as a mini-wireless-silent rave going on as well. Three DJs provided music. 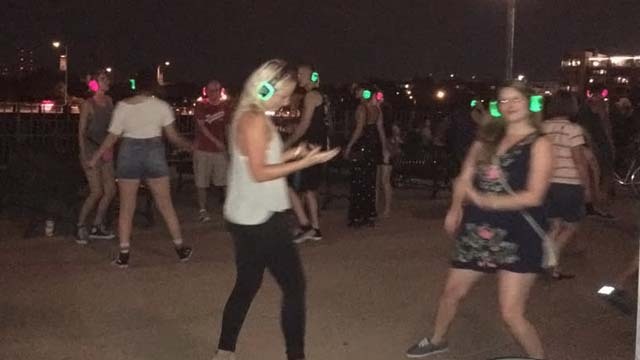 You could swap your ID for a wireless headset and dance away. The headsets had a channel for each DJ and glowed different colors for each channel.